Back when I was a personal chef, a couple of my clients were vegans. This presented a challenge to me which I welcomed; it allowed me to work at learning how to make vegan versions of common recipes such as lasagne with bechamel sauce, cream of mushroom soup and spaghetti with “meat” balls. However, my favorite recipes I cooked for these folks were the Chinese, Vietnamese and Japanese dishes which were, if not vegan to start out with, easily adapted to become vegan with no loss of flavor or texture. 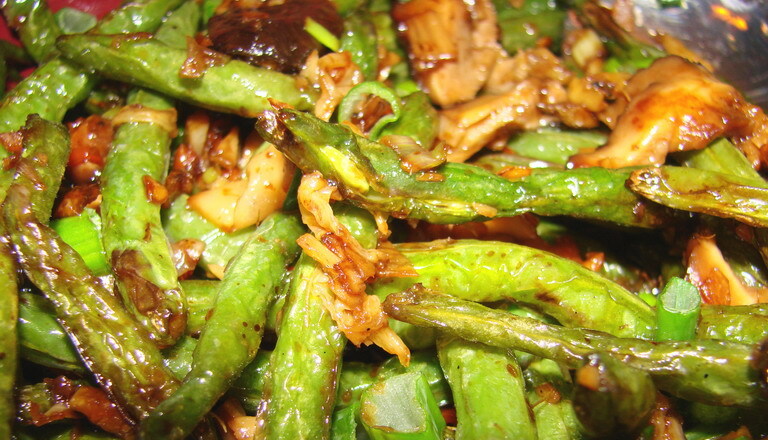 I used to make a stir-fried dish which was similar in idea to these dry fried green beans, but completely different in execution, flavor and texture. I used to blanch the beans, and then stir fry a mixture of garlic, ginger and scallion in peanut oil. Then, I would add sliced up tempeh, and fresh shiitake mushrooms, with a pinch of sugar, a shake of soy sauce and a tiny bit of black vinegar. Then, I would add the beans, and finish the stir fry off with sesame oil and cilantro. I wish I had been hip to th secret of dry fried beans back then. I think that they would have loved the way I made this variant on the more typical Sichuan Dry Fried Beans. I kept the chile peppers and the Sichuan preserved vegetable, but left out the dried shrimp and the minced pork. I could have used rehydrated dried black (shiitake) mushrooms for this dish, but I had some gorgeous and succulent fresh, locally grown shiitake on hand, and used them instead. They were delicious, and their firm meatiness contrasted beautifully with the chewy texture of the beans, while the muskiness of the mushrooms were a perfect foil to the sweet green pods. This is a simple dish to cook; it just takes a bit of extra time. In a Chinese restaurant, the beans, in order to save time, would be deep fried; here I use the more time-consuming, but more traditional technique of dry frying. Dry-frying uses less oil, and results in a better flavor than deep frying the beans; dry fried, they attain a delicious roasted flavor that is at once smoky and sweet. Much of the moisture in the beans is driven off by the longer cooking time dry frying necessitates, which concentrates the sugars in the beans, giving them a much more intense flavor. With the deep fried beans, this is not quite the case; the texture is the same–wrinkled on the outside and chewy on the inside, but the flavor isn’t nearly as good. And, besides–deep frying makes the beans more fattening than they need to be! I can’t wait until summer gets here and I can dry fry the sweet new local beans; but until then, I am thinking of trying this technique out on asparagus. As soon as the asparagus is ready, I’ll cook a version of this dish with it, and let everyone know how it turned out. Heat wok on medium high heat until it smokes. Add peanut oil, and heat until it is nearly smoking. Drop in green beans–make sure they are perfectly dry–otherwise very hot oil will sputter and splash, possibly on you! Stir and fry until the beans dry out, shrivel slightly and begin to char to a dark brown in spots. Remove when they are quite wrinkled and somewhat charred, and drain well on paper towels. Crank heat up to high and add all minced seasonings. Stir and fry thirty seconds until very fragrant. Add mushrooms, and stir well. Allow mushrooms to cook for about a minute, then add wine, and cook until most of it is boiled away. Then, put beans back into wok. Stir and fry for ten seconds to blend, then add soy sauce and sugar, then continue stir frying for about thirty seconds. Remove from heat, stir in sesame oil and scallion tops. Serve immediately with plenty of steamed rice. I love seitan. Oddly, the tempeh couple hated it. I don’t know why. Seitan, also known as wheat gluten, is great stuff. So long as you don’t have gluten intolerance or celiac disease, that is…. But yeah, I have turned numerous ovo-lacto vegetarians and non vegetarians to seitan over the years. Fun stuff. Not just for vegans. We should all try dishes like this and appreciate great flavoursome simple cooking. Thank you, thank you, thank you! I can’t wait to try these. I must admit, green beans and broccoli are my favorite veggies and I’m always looking for new ways to make them that are vegan. Oh, Trig, I agree. Vegan-style recipes are not only for vegans. Omnivores love them, too! JJ–There are two vegan broccoli recipes I have recently posted, if you have not seen them–they are Indian, and very easy. Look under the archives under Recipes–Indian. They are in the last four entries in that archive. This recipe sounds so good. I’d like to try it, but I’m in Japan and am not sure if I can to find the Sichuan preserved vegetable since I’m still pretty bad at reading kanji. Is there anything you would recommend as a substitute? Kathy–try pickled daikon or salted, preserved daikon. Or, you could use a bit of Korean kimchi. They won’t taste exactly the same, but they will be similar enough. Especially the kimchi. Just drain the kimchi well before using it. First tried them with green beans, next with broccoli both where good. Oooh–Suganya–broccoli! I have to try it! Thank you for the idea!